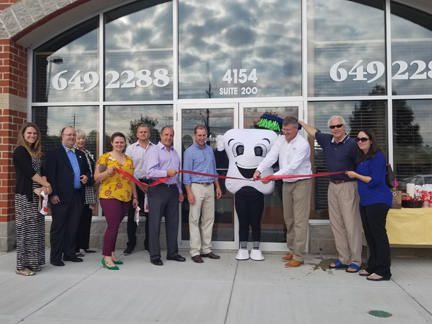 Stellar Dental, along with “Stellar Tooth” celebrated the opening of the expanded office in Hamburg with just finished renovations. They now have five offices, 22 doctors, serve more than 30,000 patients, and employ 150 people in Western New York. Finding a reliable dentist that you can not only trust with your teeth, but can afford, can be an arduous process. With insurance restrictions and varying fees and services across different practices, you may have to do a bit of searching around before finding one that fits your needs and budget. Fortunately, with the expansion of local business Stellar Dental, fewer and fewer people are getting caught up in that search. Founded by Dianna Melman in 2009 in Williamsville, the company was formed on the idea of providing a convenient, comfortable dental experience while still maintaining the individual attention and precision that one could expect at a private practice. Stellar Dental, though, removes a lot of hassle by accepting all insurances and remaining open as late as 8 p.m., according to Stellar Dental general manager of operations Kevin Georger. “We’re really open to our patients’ needs,” Georger said. “One of the things that we’re proud of today is that with multiple locations, we can get people in right away.” In addition to its Williamsville office on Transit Road, Stellar Dental has locations in Hamburg on McKinley Parkway, Tonawanda on Sheridan Drive, Cheektowaga on Union Road, and recently opened their newest location at the former French Road McDonald’s in Cheektowaga on Sept. 8. The company also held a ribbon cutting for its Hamburg facility expansion, adding eight new operatory rooms, at the start of September, and did additional work at its Tonawanda and Williamsville locations over the summer. “The concept was to be very clean, very state-ofthe- art dentistry, and the recipe worked,” Georger said. “From 2009 to today, we’ve gone from 12 operatory rooms to almost 90.” Stellar also specializes in children’s dentistry at their Union Road location, providing a more “kid-friendly” experience to nervous patients. A reason behind the rapid expansion is the growing number of individuals seeking to join their team.